C asinos and gaming facilities maintain a constant flow of visitors and need a secure system to protect their finances, which are often stored in-house. Security can be enhanced with the use of an ID card system within casino facilities. Sleek, VIP color coded ID cards indicating tiers of membership and/or access can be created, as well as employee ID cards, rewards cards, and “cash” cards that can be used instead of chips. IDSuperShop’s selection of professional ID card printers provide the base for a casino and gaming industry ID card system that can identify all persons present. When using Employee ID badges and photo ID software, time and attendance applications become more efficient and streamlined, while intelligent cards featuring integrated technologies have the ability to limit access to high security areas, except at pre-determined times. In an industry where high volumes of cash exchange hands daily, these types of security measures are indispensable. VIP membership ID cards can be given to frequent visitors of casinos in order to track access and reward attendance. When magnetic stripe ID cards are swiped and read, casino staff can track and record the frequency of entry, as well as reward their loyal customers for their patronage. IDSuperShop encourages casinos to invest in cash cards, which can help to reduce theft in an industry revolving around money. These Payment ID cards used instead of chips track winnings and losses, and allow patrons to come and go as they please. Frequent player loyalty cards can be used to track information, such as how long a customer plays a game, which games are most frequented, how much money is bet and how much is won, on magnetic stripe ID cards that visitors swipe through a magnetic stripe ID card reader when playing slot or card games. Credits issued to customers using loyalty cards can be used for discounts on meals, shows, and hotel rooms. Casino membership ID cards showing appreciation for patronage can keep casino visitors coming back. Depending on their level of spending within the casino, special privileges can be awarded to customers through casino membership loyalty ID cards. ID Badges can be used effectively for Gaming Tour Member Registration. Using personalized tournament badges, special casino visitors can be offered short-term promotional discounts and deals. Gaming activities can be monitored, as well as the coming and going of visitors every time registration cards are swiped through ID card readers. Cash-Free Purchases at on-site restaurants and retail outlets within casinos are possible using casino membership restaurant ID cards. Member-only discounts can be offered to those purchasing with membership cards, and the threat of theft is reduced when casino patrons carry member cards instead of cash. Monitoring visitor activity through ID card swipes results in accurate guest billing. 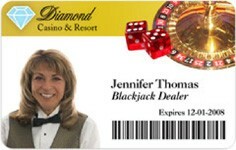 Keep track of the comings and goings of casino patrons with guest member ID cards and employees with employee ID cards.